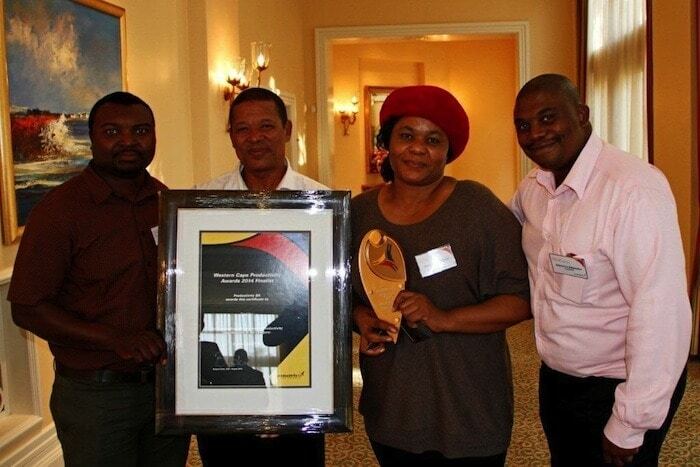 Casidra walked away with a gold award during the Western Cape Regional Productivity awards’ ceremony held at the Table Bay Hotel, in the Waterfront on the 9th September 2014. The company won the Public Sector Category, in which competed with four other institutions. The awards were adjudged from four categories, namely, the Public Sector Category, Emerging Sector Category, Corporate Sector Category and Co–operative Category. The assessment criterion for these awards include productivity approach, results and impact, overcoming challenges and obstacles, sustainability and transferability, social & environmental impacts, safety and working environment, quality, financial performance, stakeholder satisfaction, process efficiencies, growth and innovation. Productivity is a government productivity agency responsible for encouraging and driving productivity in the public and private sectors in collaboration with the Western Cape Department of Economic Development and Tourism (DEDAT) where awards are bestowed on the Western Cape’s best productive companies. This was the first time that Casidra participated in the ProductivitySA awards. Casidra’s Public Relations and Communications Manager, Experience Matshediso, received the award on behalf of the company. In his short speech, he said, “Winning this award in the public sector did not come as a surprise. Casidra has a good track record of service delivery since its inception in 1989. Until today, we still deliver project management excellence. Our work in both the agricultural and economic development sectors speaks for itself. Our proven ability and skills, ground level involvement in communities, proven track record and sound financial record-keeping, reporting and auditing make Casidra the preferred implementing agent”. Matshediso concluded by saying, “We are extremely proud to announce that Casidra is celebrating its 25 years of unqualified financial statements, and this is because of good governance”. The achievement of the gold award has made ProductivitySA and many other institutions take an interest in Casidra. They have learnt a lot about the wonderful things Casidra has done to alleviate poverty amongst the communities of the Western Cape. Public awareness on service delivery standards are high and Casidra works hard to market the role of the organisation in the project management process. Casidra is responsible for the management and implementation of identified deliverables with further operational support provided by other public entities. Finding suitably experienced service providers in the rural areas still proves to be a challenge, and Casidra has adopted a policy to source candidates with potential and through a developmental approach assist the business to fully comply. As a developing organisation, Casidra is increasingly moving towards an “Integrated Rural Development” approach by leveraging existing government service offerings that already exist for maximum impact on service delivery. Casidra renders a project management service to Departments within the Western Cape Provincial Government, local authorities, businesses, non-governmental organisations (NGOs) community-based organisations (CBOs), academic institutions, other governmental agencies and international assistance institutions. As the official implementing agent for the Western Cape Provincial Government, development projects are planned and implemented by Casidra. The type of community development projects implemented varies, but are all aimed at alleviating poverty, stimulating broad-based economic growth and unlocking the human resources and capacity in rural communities. This approach is based upon community-driven endeavours which facilitate economic empowerment and sustainability, and ultimately help to establish self-sufficient communities. Furthermore, at Casidra, we take social responsibility extremely seriously not only on an organization level, but also on an individual (employee) level. The nature of work that Casidra does amongst the communities is primarily about social upliftment. The CEO of Casidra, Michael Brinkhuis, would like to thank and congratulate everyone for all their hard work and efforts in maintaining such a high standard. Casidra will be entered in the National awards and is hoping to win this prize as well. “Let’s continue to embrace the culture and brand of Casidra”, he concluded.